Sarah Kindt, 96, of Bridgewater, SD formerly of Winner, SD passed away on Thursday, Nov. 24, 2016 at the Diamond Care Center in Bridgewater. Graveside service will be held on Thursday, Dec. 1, 2016 at 11 a.m. at the Winner City Cemetery. Visitation will be held on hour prior to graveside service at the Mason Funeral Home. 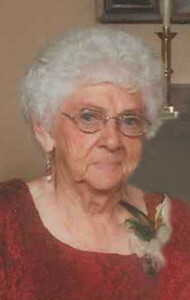 Sarah was born on June 25, 1920, to Jasper and Tillie (Routenberg) Simkins of Carter, SD. She was married to Henry Kindt and lived on a farm southwest of Winner. To this union, 2 children were born. Karen Kindt and Terry (Marcia) Kindt .